Everyone’s favorite blue bastion of justice, Shovel Knight, is once again making a cameo appearance in someone else’s game. This time, Shovel Knight and his crew of rehabilitated villains are joining Rayman in Brawlhalla, the free-to-play, Smash Bros-inspired brawler that joined the Ubisoft umbrella not too long ago. 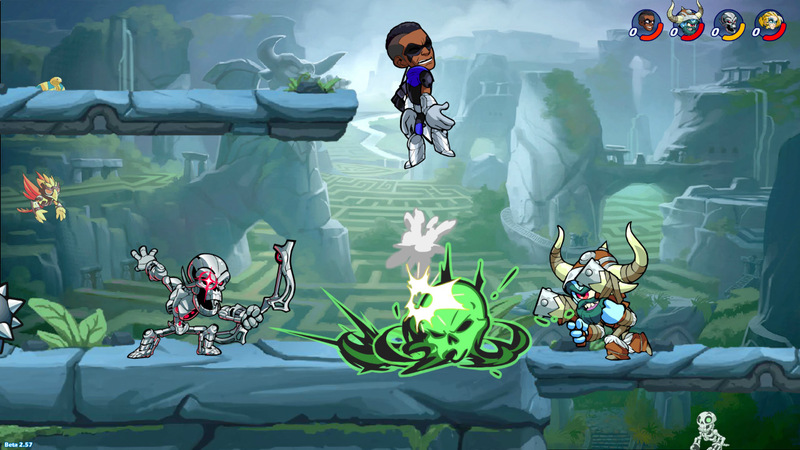 Shovel Knight, King Knight, Plague Knight, Specter Knight, and Black Knight will be joining Brawlhalla as skins for various characters, but with unique animations and sounds that make them more like themselves than the characters they’re modifying. This news comes from a recent developer stream for Brawlhalla on Twitch, the highlights of which were posted to YouTube by the official Brawlhalla channel. These skins are being added to the game on October 3, 2018, ahead of a major update planned for November 2018. As far as which characters the skins are for, Plague Knight will be on Caspian, Specter Knight on Nix, Black Knight on Orion, King Knight on Sir Roland, and Shovel Knight on Gnash. These skins will have updated animations, sig effects, and even sounds. The intent here seems to have been to make each skin as close to a new character as possible without needing to build whole, new characters from scratch. These skins will all be available in the in-game shop, presumably for some amount of Mammoth Coins.